Fabulous 2 level condominium with 3 bedrooms + a loft/office with 2 full baths featuring all high end finishes. Beautifully appointed with all granite countertops, wood and tile floors, cathedral ceilings and floor to ceiling stone fireplace in living room, stainless steel appliances large granitetop island. Main floor master with large closet and jetted tub. 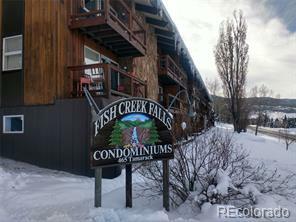 Great location between Old Town and the Steamboat Ski Area, this is an ideal second home, primary home, or corporate retreat. Directions:US HWY 40 TO HILLTOP PARKWAY, 1/4 MILE, TURN LEFT, ENTER CONDO BY BACK/NORTH SIDE, SECOND FLOOR, BY MIDDLE STARWELL.